As the days have been getting shorter and shorter, and winter sets in for real, the Merched Chwarel have been settling down to think about the next phase of the project. As well as getting out and about meeting people involved in contemporary quarry activities and with potential galleries and spaces, we’ve been wondering - and wondering while walking (as above at Cwmorthin) - about the walking element of Merched Chwarel. Not least because that is where we started. 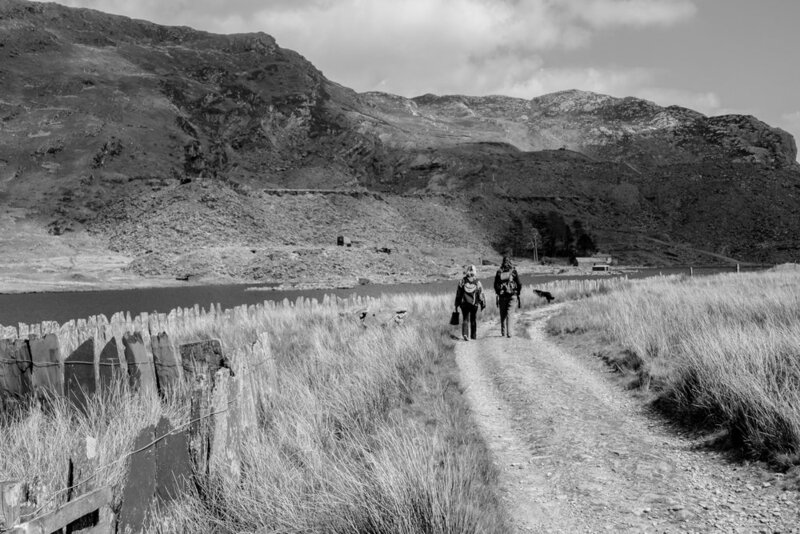 Our ‘research and development’ walks in Chwarel Dinorwig (once from Deiniolen side, once from Nantperis), Penrhyn, Rhiw Bach, Penmaenmawr felt like reconnaissance. They were about catching up, passing through, making connections (to each other, to stories, to people we met), assessing potential. Overwhelmed a lot of the time by what we found. It was very sociable. We did a lot of (monoglot/bilingual) chatting, and a bit of performance. We found ourselves picking up things. Pionting things out. Some sketching. Quite a bit of photographing. Picnics. Lots of looking. Listening. Discovery. We found that walking together is a very different experience to that of walking alone. It is much more complicated. We were not at all like the classic ‘walker’ (male – from Caspar David Friedrich's image of the 'Wanderer' to the Situationalists to Richard Long), unfettered or separate from the world. It was quite the opposite, most conversations about life complexities, relationships, stories. It took quite a bit of effort to get us to ‘focus’. And the moments of focus were almost always over a picnic, in an abandoned house or old chapel, rather than as we were moving. It feels unclear whether this was a problem, or whether it is illustrating something about the essence of the project. So, as we re-start the Merched Chwarel project and our walking as a core part of that, it seems timely to reflect on what it means for us to be women in the landscape, in a monumental and (largely/in most places wholey) man-made landscape. And about women walking – together. Luckily help is at hand. A bit of research has revealed two insights that might together provide a great framework within which we, Merched Chwarel, could think of our entangled collaboration, and potentially avoid some of the bear traps (although inevitably, we will become involved in some)! b) Everyday vs heroic: avoiding the prioritizing or opposing of distance and dislocation over locality and rootedness; focusing on (confusions of) scale rather than the freedom of the epic task. These approaches seem to bring in all sorts of elements that we have been grappling with, and provide a flexible and creative way of dealing with them. This all seems to fit so well with where we keep finding ourselves as Merched Chwarel! Perhaps we these ideas might help frame our project, and our collaboration itself, as we take our first tentative steps back into the project in 2018….